Financing a new vehicle has gotten easier again, especially on larger vehicles. 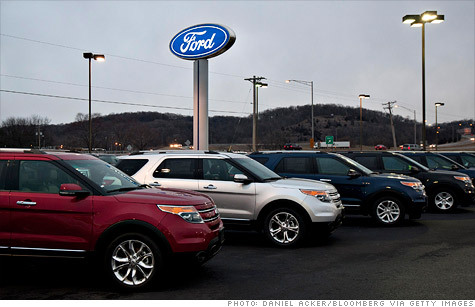 NEW YORK (CNNMoney) -- If you're going shopping for a new car we have good news for you. You can now get a car loan even if your credit rating isn't perfect. Car lending has finally returned to more-or-less normal after a few years in which auto lending went from crazy-easy to crazy-hard. Before the financial crisis, it seemed that anyone could get a car loan regardless of their credit history or income. "They were pretty much lending to anyone with a pulse," said Jesse Toprak, an industry analyst with Truecar.com. Then, once the crisis hit, it was just the opposite. It was hard to get a car loan even with stellar credit and impossible to get one without it. Now, people with good credit can once again borrow money to buy a new car. Even those who've slipped up a little can get money to buy a car, providing they're willing to pay a higher interest rate. 0:00 /2:45What's driving the manufacturing rebound? "I don't think you need to have the 800-plus FICO score that was probably necessary in 2009," said Alec Gutierrez, an industry analyst with Kelley Blue Book. Low interest rates on all types of loans are obviously part of the reason auto loans are easier and cheaper to get, said Gutierrez, but the tight market for used cars helps, too. Used cars are in short supply these days, so good used cars are worth a lot. That means even if things come out badly and the financing company has to repossess your car and sell it as a used car, they'll at least get good money for it. So sub-prime loans, those "risky" loans made to people with relatively low credit scores who are most likely to default and have their rides repossessed, are now possible. "The subprime market has come back to life, where it was non-existent a few years ago," said Dave Wescott, president of Westcott Automotive, Burlington, NC and vice-chairman of the National Automobile Dealers Association. Lenders are now willing to look past the simple credit score number and consider the reasons for missed payments, said Toprak. Maybe having missed a couple of mortgage payments won't sink your chances. "Having looked at over 5,000 loan applications, credit score is not the best indicator of people's ability to repay," said Toprak who formerly operated auto dealership financing departments. That's especially true now, when many have had trouble making mortgage payments, said Toprak. A person's income is actually being considered by auto financers, he said, whereas they might not have even looked at that in the past. Still, not everybody is being that thorough. Car buyers might still have to shop around a little to find the best rate, he said. Experts usually recommend shopping for auto financing even before you begin seriously shopping for a new car. Going into the dealership with a competitive auto financing deal in hand provides an incentive for the dealer to work hard to beat it. In most cases, the dealership will be able to provide the best financing deal, given that auto dealers have access to special loan rates provided by auto finance companies affiliated with automakers. Rates are particularly good on pickups and SUVs, vehicles that aren't selling as they once did, said Gutierrez. General Motors, for instance, is offering 0% financing for 72 months on the soon-to-be-discontinued Avalanche truck. That rate is, of course, available only to "qualified buyers."